When I’m teaching, or working with students, I often get asked about my design process. People often assume that as a designer, I work in the way designers are normally taught. Start with a brief, do research, prepare a sketchbook, make samples or prototypes, refine the design and then make it or – in many cases – have it made by someone else. Not me. I have very little professional design training. I did an a-level in art and textiles when I was 18. I did a 10-week evening class in textiles about 8 years ago and a year of tailoring evening classes about 5 years ago, and a couple of week-long summer schools on fashion marketing and experimental fashion design when I quit my job 3 years ago, thinking I might work more in the fashion field. I actually decided that textiles had to be more central to my life 6 years ago on holiday in Mexico, but that’s another story. As a self-taught designer, my design process goes like this. Potter about in studio, fiddle about with fabric. Idea pops into my head. 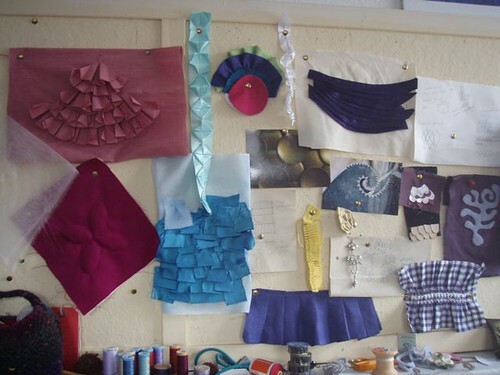 Start scrabbling about with fabric, make sample, start work on major piece IMMEDIATELY! 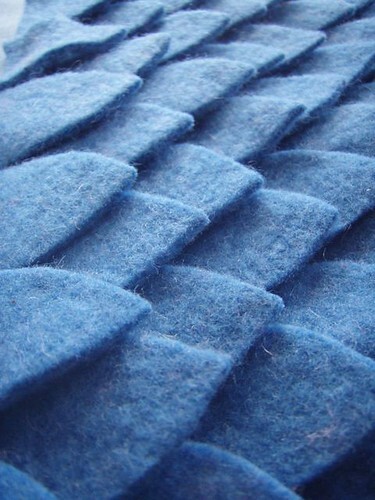 Mostly the ideas have filtered through my brain for some time before they get to the fabric fiddling stage. I’m not always at all sure where they have come from in the first place – something has seeped in and been swirling about. Sometimes I use specific stimuli to develop ideas. 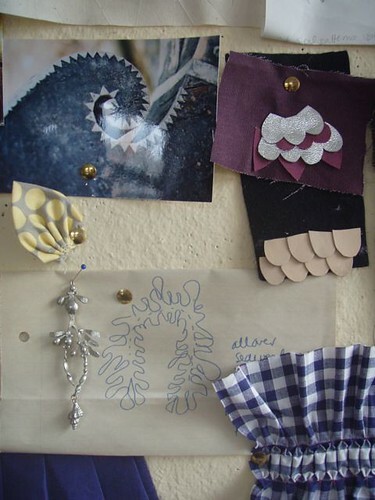 Very specific stimuli in the form of historic dress and textiles, a never-ending source. Other stuff trickles in, mostly from architecture and from nature. 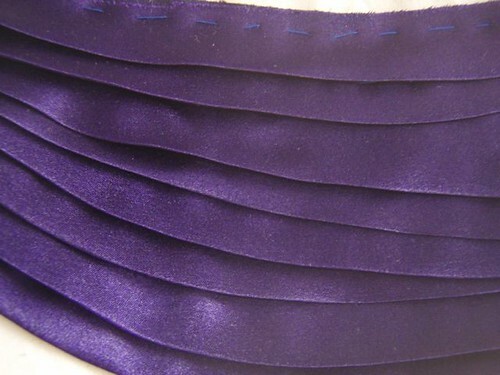 Its pretty disparate and quite random, but the fundamental part of it for me is working with fabric. Sometimes I have ideas that just don’t work when I try them in fabric. Very often something new develops from the process of playing around, and indeed that is how I develop most of my work these days – as progressions from things I have done or tried before. There’s nothing I love more than playing around with fabric so it was a pleasure to spend a few days pottering and working on new ideas for major exhibition piece for Origin. The result is lots of ideas and not a large enough piece of any fabric to make any of the pieces I planned. At least, not of the sort of fabric I want to use. I am loathe to buy more when I have acres and acres of fabric, really a quite ridiculous quantity. So the ideas are having to putter and filter and smoosh around in my brain until the right thing just sort of appears. It always does. At least it always has, so I have faith that it will again. In the meantime I can play with some ideas for smaller pieces which don’t need quite such huge swathes of just the right sort of fabric. Pretty much everything I do is designed around one specific piece of fabric. The same idea just wont work in something else. I spend hours pondering a piece of fabric, waiting for the right combination of fabric and design to come to me, sometimes over the course of several weeks or even months. A few months ago I bought some vintage orange spotty synthetic fabric because it was there. I quite liked it, but wasn’t sure how on earth I would use something so stiff, shiny and synthetic. Its just not my thing. 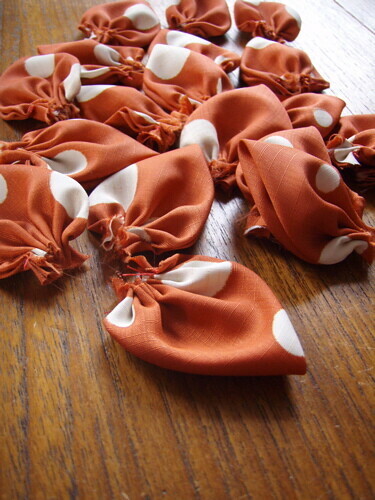 While making little folded petals for a book project (which I didn’t in the end use) it struck me that this orange fabric would make nice big folded petals. So I set a student to cutting, folding, stitching. I tried a couple of ideas with them. Didn’t like what happened. Put them back in the box. And there they have sat for several weeks while I was busy doing other things. Last week I started playing with them and another idea occurred to me, which I immediately sampled and then put back with a happy sigh. The right idea. Then this week I put the final piece in the design jigsaw and I know that I’m making a big piece of orange folded petal-y things and have a student in place to cut, fold and stitch the rest of the elements in place next week. I may not like the result so it may never see the light of day (or light of blog). That happens too. But hopefully I’ve got it right on this one. I’m looking forward to sharing it with you!